I kind of hate all those Facebook plug-ins and apps and what have you. I hardly ever use Spotify because I don’t like broadcasting what I’ve been listening to. I block all sorts of other things. But some tinch of OCD in me made me want to count up which of the 50 states I’ve actually been to – just to satisfy my own curiosity. It turns out that I’ve been to twenty-five states, as long as you count flying in for lunch, or changing planes. It’s not like I’ve slept in all 25. If we drive across the country one day, we could cross a bunch off the list. Thanks to childhood roadtrips, a post-college cross-country drive and a previous job that involved lots of travel, I think I've visited (however briefly) most of the states. But not: Alabama, Alaska, Mississippi, Idaho and North Dakota. I have been to all the lower 48, mostly by car. I think I spent about 62% of my childhood in the car. I only hope that people don't look at me and say, "Man, that lady has A LOT of miles on her." Because, actually, I do. On the plus side, going for a 12-hour drive is no big deal to me! So there's that! Alaska (honeymoon), California (work trip/family vacation), Illinois (first 5 years of my life), Indiana (visiting a friend from college), Iowa, Kentucky, Michigan, Minnesota (from age 5 to age 18, plus grandparents lived here), Missouri, Montana (went apartment hunting with a friend), New Jersey, New York, North Dakota (was injured in a soccer tournament in MN, but nearest ER was in Fargo -- totally counts, right? ), Ohio (college), Tennessee (wedding), Wisconsin (grad. school and then stayed), Utah (Salt Lake City -- because changing planes definitely counts). i dont know how many i've been to, but i am so counting 'em up right now! I am also a total sucker for this sort of thing. I haven't been to most of the south (except Florida, Louisiana, Tennessee)or Alaska, but almost everywhere else, I think. Oh, I don't think I've been to Oklahoma, either. How on earth did you fly to Wyoming? I had some excellent pancakes once in Jackson, near that park with the arches made of antlers. Poor South Carolina! Why do you shun her? Thanks to work travel, I've been a few places. In fact, I highly recommend Minnesota. it's beautiful in the fall. When I was 15, I took a bus trom Hartford, Connecticut to Los Angeles California. The only place I remember stopping was in Las Vegas, but I'm sure we hit a number of the states across the middle of the country. Doubtful if I've made 50%, but I have hit some of your misses. I was born in North Dakota, and on that Chicago trip to BlogHer I also stayed with friends in Wisconsin. Between college and grad school, I drove Rt. 80 from NY to SF. Woo hoo! Lots of big states to drive through. Cool idea for a post. I discovered I'm only 5 states short of 50--no Arkansas, and I've never bit to the northern plains. I'm missing some in the middle of the country. Does it count if you've seen states out of an airplane window? 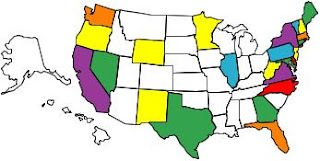 I haven't been to Maine or any of the states between Kansas and California except Colorado and Arizona. I'm not sure airports should count; we have a (crackpot)theory that they're all part of one big underground facility with lots of different exits. Yet another reason for you to come visit. I'm up to 30 -- missing lots of Southern states. I always knew I'd been in a lot of states, but never bothered to count them up until now. In fact, I'm missing just four: North and South Dakota, Minnesota and Alaska. The rest I've at least stayed overnight if not longer. In most of the States and all of the provinces - advantage to being old and foot free. Plus Africa, Europe in several spots, ditto. Neat idea to do a map. Like it. I've been to 48, thanks in large part to the a pop up trailer and camping crazy parents. Moving around a lot helps, too. I'll get to Alaska and Hawaii someday, I swear.